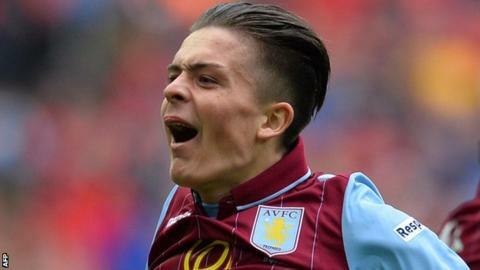 Aston Villa manager Tim Sherwood has urged Jack Grealish to focus on his club career - before making a decision on his international future. The 19-year-old earned rave reviews for his display in Villa's FA Cup semi-final win over Liverpool on Sunday. Birmingham-born Grealish has played for the Republic of Ireland at under-21 level but has yet to earn a senior cap and could still play for England. "It is up to Jack where he wants to go. It is purely up to him," said Sherwood. "What I have got to do is make sure he has got that decision to make. He must be doing something right for Aston Villa if he has got those options. That is my priority. "That's the decision he had to make and now Jack has got to make that decision. He has to play a few more times for Aston Villa before he needs to make that decision." Grealish is believed to be on England Under-21 boss Gareth Southgate's radar, but the teenager has said he planned to play for the Republic's Under-21s in their Uefa qualifier against Andorra on 8 September.